We celebrate today the feast of Holy Family. The feast was established in 1921 by Pope Benedict XV. This feast is meant to be “a day for Christian families to examine themselves by comparing their way of life with that of the Holy Family at Nazareth. Preoccupied with the dangers that threaten families everywhere, in 1981 the late Pope John Paul II issued a letter, addressed to all Christians to render them aware of the role that families are called upon to play in the church and in the world. In today’s Gospel St Luke gives us a vivid picture of the Holy Family. St Luke affirms certain characteristics visible in the family at Nazareth. First of all it was an intensely religious family. It submitted itself to the commandments of the religion. St Luke writes, “Every year the parents of Jesus used to go to Jerusalem for the feast of Passover. It was obligatory that all male Jews living within a reasonable distance of Jerusalem were bound to go on pilgrimage and worship at the temple. Three times a year. This obligation is prescribed in the book of Deuteronomy. The first lesson the Holy Family puts before us is to obey the commandments of the church. Attend Sunday Masses and Masses on the days of obligation. Introduce children to the activities of the church and the parish. But today in the fast pacing world we do not have time to attend full mass even on days of obligation. The only convenient thing to avoid is the church activities. Many try to limit their visit to the church only for special occasions in their life. Such people find uncomfortable when they make their visit once in a blue moon. This approach should change. We should encourage our children to participate in all the activities of the parish and actively participate in the liturgy. The next characteristic is initiation given to the children at the right time. St Luke writes: “When he was twelve years old they went up for the feast as usual”. A Jewish boy was declared an adult with all rights and obligations at the age of thirteen. Parents would take their children once a year before he was bound to attend. So Jesus was taken to the temple at the age of twelve. The distance between Nazareth and Jerusalem was about 112 k m (70 miles). At that time most of the travelling was done on foot. The journey was often dangerous too. In spite of all the hardships they never failed to observe the prescriptions of the religion. Our children too often stay back, in the theatre, in the park, in the game centre, and learn the wisdom of the world. Instil these values in them and you will hear the good news that your children stay back in the church, listening to the word of God. Today’s first reading sets forth a beautiful guideline for the families to be followed. It invites the children to have deep respect for their parents, particularly when they are old. Dear brothers and sisters, As we celebrate the feast of the holy Family of Nazareth let us imbibe the lessons the Gospel puts before us from the Life Style of the Holy Family and mould our families too after it. Second Word War lasted for about 6 years. It shattered the peace, joy and hope of millions. Soldiers began to experience the futility of war and longed for a dawn of peace. But peace seemed an utopia. A blood chilling night of December 24. German soldiers hid themselves in the cold bunkers watching for the movement of the enemy, the English soldiers who occupied the opposite dark bunkers. Death hung over their heads like the sword of Damocles. Heaven provided a contrast with clear sky, shining with twinkling lights and free from the fire emitting war planes... It rekindled in their hearts the sweet memories of Christmas. Stars and candles, plum cakes and chocolates, Christmas trees and carols flashed through their minds. Dear brothers and sisters. December 21st is the shortest Day for the year in the Northern hemisphere. After that the length of the day progressed. So the Romans, in ancient times celebrated the feast of light. And the celebration fell on 25th December. St Paul, in today’s second reading proclaims that Jesus is the radiant light of God’s glory. The light comes from the east, goes the wise saying... The sun rises in the east and slowly dispels the darkness that engrosses the world. Today we celebrate the birth of Jesus, the ever shining light of God’s glory. St John quotes the words of Jesus, “I am the light of the world.” In John’s language light stands for goodness, for holiness, for live, for joy, for life and for God himself. We are all familiar with the importance of light. In India it is customary that a light is lit and placed in the front of any house. It dispels the darkness in the house. When Jesus was born a huge light, never seen before, appeared in heaven. It proclaimed the birth of a divine child, and the wise men followed its path in search of the child. The star, the song of the angels and the message of the birth of Jesus divided the human race and put them into two camps. Herod and the high priests found their throne challenged; they conspired against the child, they hatched plans to annihilate the light. They spent sleepless nights pondering over it. But on the other hand the comet was a joy for the simple shepherds, the wise men and the whole creation. They flocked to the manger to glance at the new born babe, the promise of ages. Who heralds peace, brings happiness and proclaims salvation. May the peace of the infant Jesus reign in your hearts and houses. do not express it. Hold it for a moment. delay it by a breath. into men and women of peace. The Messiah is a man like us. He will be born in Bethlehem, and he will bring peace. He will restore harmony in nature, harmony among creatures, harmony between man and man, and harmony between God and man. How will peace and harmony be restored? It is not by sacrifice, neither by holocausts but by submission to the will of God. The letter to Hebrews postulates it. “God, here I am! I am coming to obey your will.” This is the new law established by Jesus; obey the command of God. The one who does it will be hailed by ages. Mother Mary submitted herself to the will of God, so Elizabeth called her “Blessed are you among women.” And the whole world for the last 2000 years has been hailing her as “Blessed.” This is the theme of the today’s Gospel. Whenever harmony among men; harmony between God and man was lost God sent his messengers to restore peace and harmony. That mission is continued even today. Today we are the chosen instruments to bring peace to the world. Any attempt to bring peace is held in very high esteem. Nobel Prize is awarded as recognition of individual’s endeavour to establish peace. Volunteers enroll themselves in the National and International organizations to bring peace to the world. Yet peace remains a mirage. Because most of our attempts are like building castles on the sand. Devoid of a strong foundation, they collapse. Today’s second reading and the Gospel affirm that the foundation to attain peace is submission to the will of God. On the morning of the 4th of December 1982 in Melbourne (Australia) Nick Vujicic was born. His parents were shocked because their first born had neither hands nor legs. A baby boy without legs and hands. It took a number of months of tears, questions and grief before coming to term within their own hearts. Nick grew up with the support of his parents and gained strength to challenge his own destiny. Now young and has a Bachelor’s degree in Commerce. 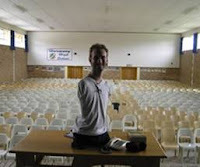 He is also a motivational speaker and loves to go out and share his story with others. In his speeches he emphasizes that God has a plan, and we must accept the plan of God and submit to the will of God. These words come from a man who does not have hands and legs. That makes it all the more meaningful. St Francis of Assisi is recognized as a man of peace. His message revolutionized Assisi and spread to the ends of Italy and to the whole Christendom. The call of Gandhiji to give up violence and love peace crossed the boundaries of India, and worked miracle in Mont Gomery (America), through Martin Luther King. Everywhere we want our ideas to be accepted, we want everyone to recognize us, we expect everyone to behave as we want them to, we desire everyone to think as we want them to. So there arises disagreement and discontent. They proliferate from individual to the family, from family to the society, from society to the nation, and from the nation to the international level. Harmony gives way to chaos. We try to avoid those who do not agree with us. Some try to annihilate those who do not agree with them. And it gives rise to bloodshed and homicide. When you feel angry with your friend, do not express it. Hold it for a moment. When you feel to shout at your neighbour, delay it by a breath. Before you point your finger at your co-worker wait for a second. And these fractions of seconds will transform you into men and women of peace. Then we will be ready to welcome Jesus into our silent, holy hearts where all is calm. John clearly tells us that there are people who can be compared to precious grain, while others in God’s eyes are useless chaff or husk. Who are these grains? They are the ones who share one of their two tunics with their brothers; the ones who share their food with those who don’t have anything to eat; the ones who do their duty justly, and be contend with their pay. The shortest way to reach God is our brothers, who are around us. The lesson John conveys is that any person can attain salvation if he is concerned about his neighbour’s needs. A person may be truly poor, but no one is so poor as to be unable to help his neighbour in some way or other. Love for neighbour is at the core of the message of the prophets, the message of John the Baptist, and the message of Jesus. Love for neighbour is the very essence of the Gospel. The story relating to Poonthanam is very thought provoking. One day the Lord assured Poonthanam that He would visit him. Poonthanam prepared delicious food and waited for the Lord. Then a boy came to him. He requested Poonthanam to give him at least a little food to taste. But Poonthanam drove him away. Then came a traveller. Poonthanam turned him away without showing any hospitality. The third visitor was an old man. Poonthanam refused to treat him too. He waited for the Lord’s arrival, but he was disappointed since god did not visit him till the night fall. Then he went to bed. Poonthanam learned a great lesson - The invisible god makes himself visible to us through our brothers. Whenever social justice was at stake, God intervened. He sent his prophets to raise their voice against it. Saul raised his hand against Gibeonites (2 Sam 21:2) and God punished them with famine that lasted for three years. King David raised his hands unjustly against his subject Uriah, and took his wife. God’s judgment fell on him through the voice of Nathan (2 Sam 12:11). When injustice spread in the society, and men rose against men, Ezekiel condemned it and prophesied against them. The message of John reminds us that one who wants to find place in the presence of God should be willing to share his belongings with his brothers. Often we tend to limit the concept of sharing with the material possessions alone. Along with material possessions we can share many things, our talents, our time and our sympathy. His looks were cold, he gave me gold. How shall I pay him back again? A sympathetic glance, an innocent smile, a kind word and a gentle touch can often work wonders in the life of many. People gathered around Jesus to listen to his words of kindness. Even on the way to Calvary, crushed under the weight of the cross, he stopped to console the lamenting women of Jerusalem. Dear brothers and sisters God wants us to be generous with our brothers. To be kind and gentle to them. Our acts of generosity and kindness will turn us into precious grains in the sight of God.